This stand alone HD DVR recorder allows user to record their favorite video game play, cable channels, computer HDMI DVI or other HD content at HD resolution up to 1080p through its HDMI or component A/V hookup. It is a full-featured and high performance H.264 DVR Recorder with no computer hookup required. 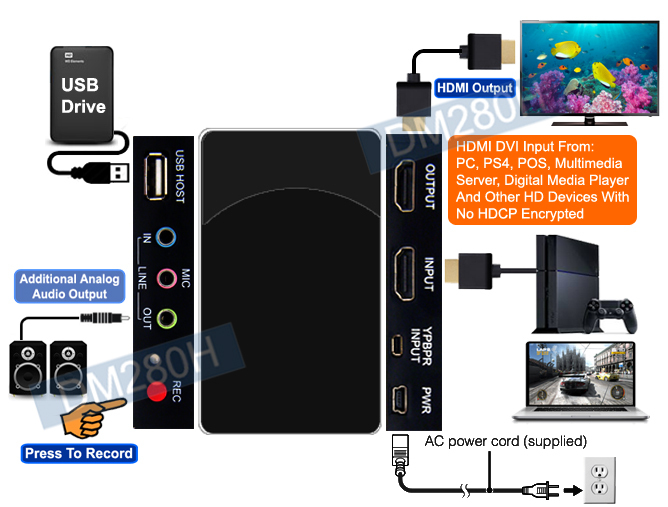 Any HDMI, DVI and component video device such as game consoles, videoconference terminal, computer, HD set-top boxes, HD players, multimedia server, microscope, can be recorded and encoded into H.264 MPEG-4 format with less storage drive space needed, crisp clear images and sounds. This digital video recorder has H.264 hardware encoder built in, which can compresses digital video file very efficiently, using much less(1/3) of the space what MPEG-2 DVD file takes. This means users can enjoy stunning HD video the way it was meant to be seen without sacrificing speed or performance. This HD recorder provides users with a HDMI output as pass-through so users can see what is being captured on TV, projector or other HD monitor from HD source devices in real time with no lags. 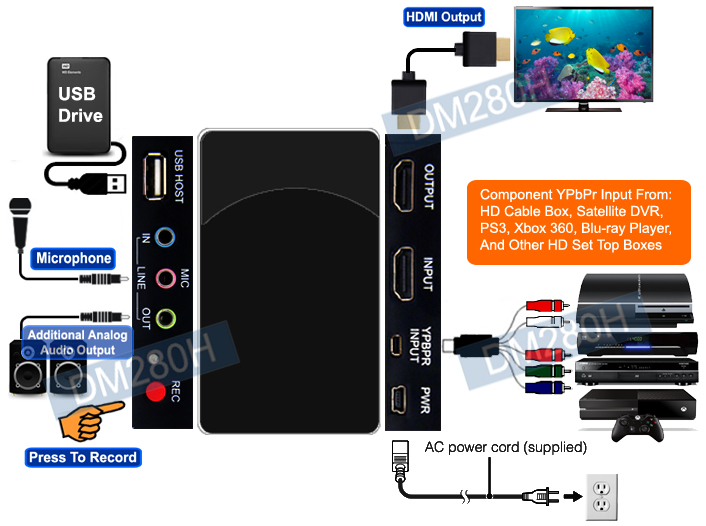 Users can use this HD DVR for recording HDMI or DVI output from computer, HD media player, PS4, multimedia server, POS station or other HDMI DVI equipments in digital files. 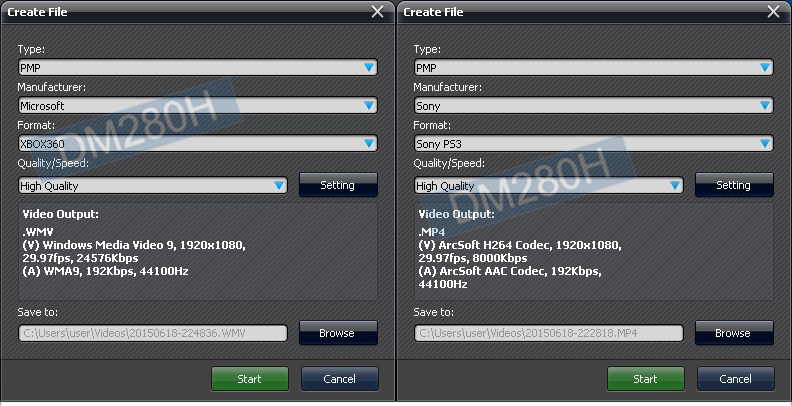 The recorded MP4 video resolution will match with original HDMI or DVI video input resolution. Enjoy stunning HD video captured at the same high definition pixels meant to be seen with speed and performance. Users can also use this HD DVR for recording component YPbPr video output from any HD device. Recording by using component video feeds has the same premium image quality as by using HDMI. Users can view what is captured through a HDMI link with TV and record the video footage into an external drive at the same time. 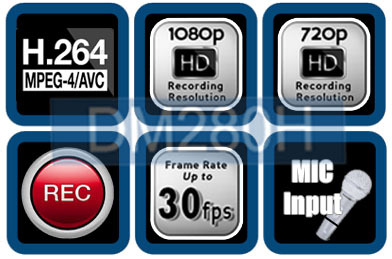 This HD recorder also supports microphone input for adding voice commentary into the recorded video footage. This mic input is only for component video recording. HDMI input does not work with mic input together. The video editor uses a storyboard screen with timeline for video construction. Users can easily add texts, images, transitional effects, vocals and additional video clips to be displayed in the storyboard before publishing. The video text function of the editing software provides users with an easy and intuitive interface for users to type in the text content and customize the font style, size, position, color for the title text or subtitle directly on the preview window. 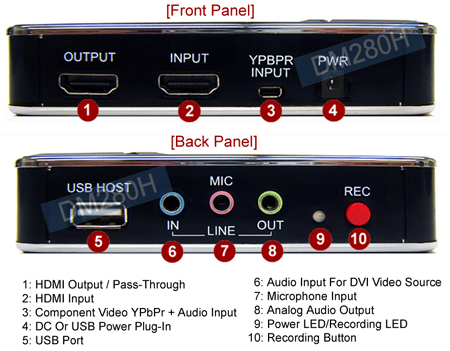 Stand alone HD video recorder with HDMI input and component video input. Supports all HDMI and component RGB video input resolutions at 1080p, 1080i, 720p, 576p, 576i, 480p. Adding voice commentary into the recorded video footage when component video input is used for recording.